David Nordfors, Director, Innovation Journalism Program at Stanford. HOW CAN THE NEWS INDUSTRY SUCCEED IN THE INNOVATION ECONOMY? Eric Muller, Entrepreneur-in-Residence, The Kauffman Fellows Program. Hotels - Nearby hotels offering Stanford Preferred / Discounted Rates. Visitors Parking - Closest parking area to the conference venue is the Tresidder Parking Lot. Stanford's Marguerite Shuttle - Free shuttle service - Line B (Clockwise or Counter Clockwise) will drop you off in front of Tresidder. Violeta Bulc:How Do we Innovate? VentureBeat - How does journalism work, now that old media is in disarray? 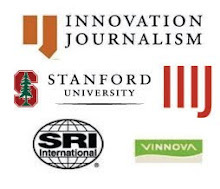 The conference is a yearly event, centered around the Innovation Journalism Fellowship Program at Stanford, run by SCIL and VINNOVA. The Conference on Innovation Journalism is a gathering for professionals to discuss the interaction between journalism and innovation, including how to cover innovation in the news, how innovation is changing the profession and business of journalism, and how journalism links innovation with society. Target participants for the conference included journalists, professionals connected to the media/communications industry, innovation experts, students, and researchers. The aim of the conference is to improve the understanding of how journalism and innovation drive each other, and to identify the key components of innovation journalism. This will involve looking at the innovation ecosystem as a playing field for journalism and choosing strategies that will allow media outlets to deliver quality news using the latest technology and to thrive in a competitive marketplace. 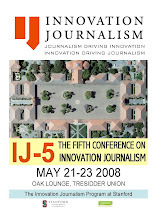 The concept of innovation journalism was coined in 2003, with the creation of the program.